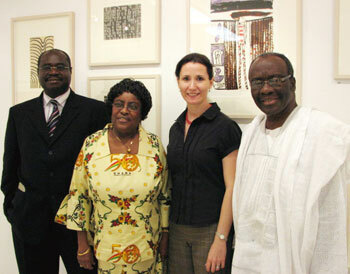 The High Commissioner for the Republic of Ghana, His Excellency Mr Kofi Sekyiamah, recently visited Charles Darwin University (CDU) and met with Vice-Chancellor Professor Helen Garnett. The High Commissioner was accompanied by his wife, Mrs Olga Sekyiamah, and Minister-Counselor Mr Michael K Banahene. The Vice-Chancellor provided the High Commissioner with an overview of the University and explained that CDU was a dual sector education provider with excellence in both higher education and vocational training and education. While on campus Mr Sekyiamah visited CDU’s Northern Editions Gallery to view the current exhibition and tour the printmaking workshops. Mr Sekyiamah expressed a great interest in the traditional printmaking techniques involved and the work artists undertook in remote communities.